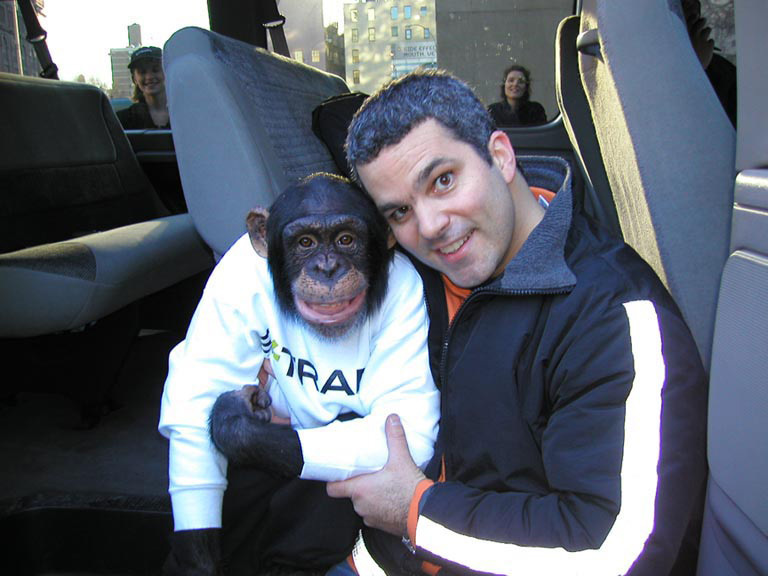 15 years ago the E*Trade Chimp was on a press-tour to promote his upcoming Super Bowl ad (years later CIO Magazine would vote it "one of the 10 Best Commercials of All-Time"). He was kind of a big deal. His name was Jonah. The plan was to shoot in AdWeek's offices, but at the last minute security wouldn't let a chimpanzee in the building, something about insurance. They told us at the loading dock (that's often how we enter buildings with our equipment). Looking around I noticed a nearby fire hydrant//thought it would add character.and Jonah could lean on it, sit on it, etc. We quickly set up battery-powered strobes which worked super given the contrasty light in lower Manhattan. Shooting on location requires thinking on your feet and being open to new ideas... but above all you must be prepared. I got along pretty well with Jonah the E*Trade Chimp at least I think so, he wouldn't stop hugging me. Jan. 28, 2002 AdWeek tear sheet.